Soul Spices was released 2 years ago, a self-published book, a labour of love. A huge part of my journey. It is what has brought me here to all of you and I’m extremely grateful. I am even more thankful to the publishing house Amat, for giving it a second lease of life and publishing a SECOND edition of Soul Spices! It’s such an honour and I’m very excited to share with you that the book will now be available all over Spain and Latin America! You will also be able to get the ebook on their website, on iTunes, Amazon, and Google too! 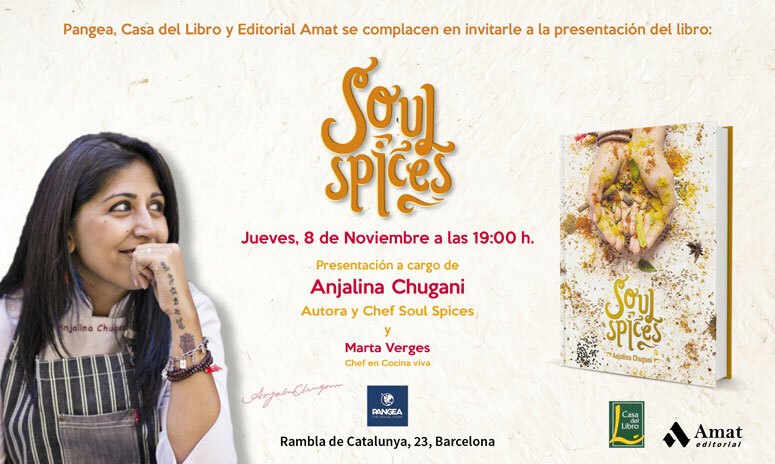 If you live in Barcelona and would like to come and meet me, I’ll be presenting and signing my book, Soul Spices, on the 8th November at Pangea Travel store at 19h! Indian Vegan Masterclass Festival – My very first ebook!